I'm excited to announce that I'll be relocating my Yoga Studio to the friendly neighborhood of Brookside in August! I have a new name, a new place to call home, and new relationships forged with common goals. It's been a month of soul searching, reflection, and practice both on and off the mat. In the midst of it all, I've reconnected with the community I grew to love over the years by teaching and practicing all over town. Returning to my foundation has renewed my trust in the path of yoga at a time when I questioned everything: its history, its authenticity, the business reality, and whether or not I should continue. I've been met with an outpouring of love and support greater than I ever imagined. I can't wait to roll out the New and Improved version of the Training I developed and delivered earlier this year! I'm collaborating with even more knowledgeable instructors from all over, and I'm proud to once again offer a comprehensive study of yoga that is relevant to the modern day practictioner. Come to the FREE Information Meeting at the Studio on Sunday, August 6th at 1:00PM, and I'll answer all of your questions! Not only that, we will continue to have special workshops and events to serve the whole KC Metro Area. 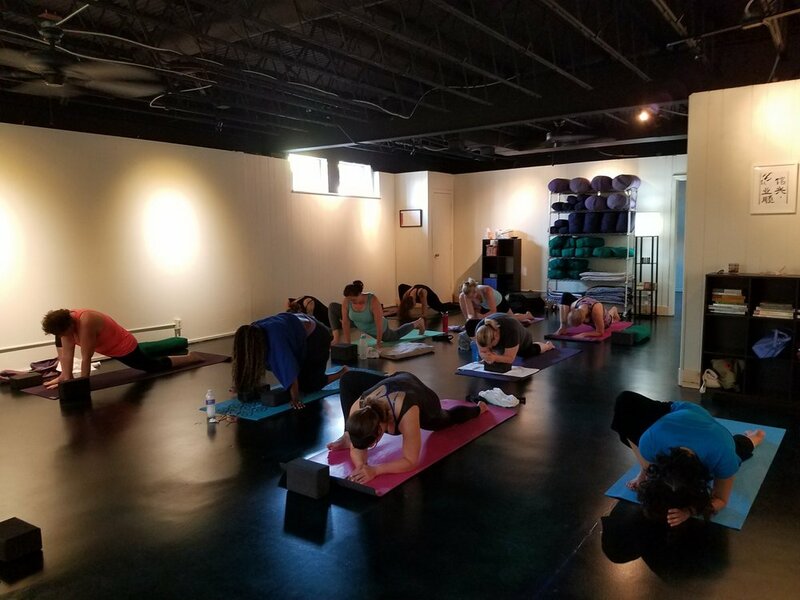 At KC Yoga Kula, your first week is always FREE, so come check us out, and stay for the community, the practice, the love and laughter! My new studio will be located at 912 E 63rd Street, KCMO. It's just a hop, skip, and a jump from some of your favorite Brookside Establishments - including Simple Science Juices, Canihaveabite, Unbakery and Juicery, Heirloom Bakery & Hearth, Savory Spices - and a whole lot more! We'll have temporary quarters on the 2nd Floor while our studio space is being readied....stay tuned. Classes will begin with a celebration on Saturday August 5th! I hope you can join me! KC Yoga Kula - Off to an Auspicious Start!